It was ten years ago and I was in a hospital bed recovering, just hours after giving birth to twins via a double-whammy (a vaginal birth and a c-section). The pediatrician had arrived to do a quick examination of both boys. He sat on the edge of my bed, reached into the crib they shared and tickled their toes. That was a word I was unprepared for. When we learned I was carrying twins five months into my pregnancy, my doctor assured us they were fraternal. The placentas had implanted on polar opposite sides of the uterus. 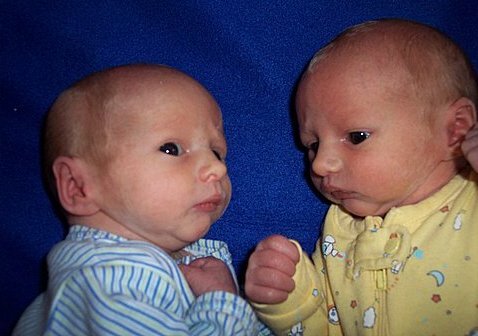 Identical twins who have their own placentas implant close together, he said. They couldn’t possibly be identical. Imagine all the ways parents could screw up identical twins! Then along comes this hospital pediatrician, telling me our look-alike babies are identical. (Okay, so maybe we had our suspicions after we held them that first time.) Six weeks later, DNA tests proved him right. I’ll just Google some information on raising identical twins or buy a book. But I found nothing anywhere. So at my husband’s urging, I started a blog. I recorded the development of our twins from birth through their sixth birthday, supplementing the posts with research, fun facts and advice from my own experiences and the trials and errors of others. I felt a bit like a journalist again. It was fun and it was, according to the comments and emails I received, appreciated. I ended the blog on their sixth birthday, figuring they had reached an age where they deserved a new level of privacy. But the emails didn’t stop. Several readers suggested I create a book, something they could give to relatives or to other new and expecting parents of identical twins. I toyed with the idea while working on my fiction. Finally, I put the fiction aside for a bit and dove in. Raising Identical Twins: The Unique Challenges and Joys of the Early Years will be released in just a few weeks.